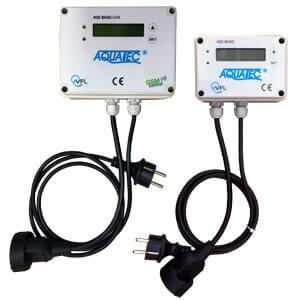 Microprocessor control unit AQC BASIC and AQC BASIC GSM is used for fully automatic control of the amount of air supplied to the wastewater treatment plants Aquatec VFL. It regulates various technological processes in wastewater treatment plants, automates, simplifies and makes the operation cheaper. In case of using microprocessor control units, the service center can advise you in special cases also by phone. In the case of using the GSM module, the service center of Aquatec VFL is directly informed about the current state, respectively problem of wastewater treatment plant, in which the control unit is operated. Microprocessor control unit AQC BASIC and AQC BASIC GSM is completely manufactured, tested and certified in Slovakia. The quality of the materials used, the design of the control unit and the design allows for trouble-free operation, even in wet environments (IP 44). The controller has several standard operation modes for running the wastewater treatment plant, but also additional modes such as Holiday or Weekend House mode. The simple choice of modes can reduce energy use and adjust the output of current wastewater load, thereby highly effectively work of wastewater treatment plant and comfort for the user. The control unit can be placed in garages, basements or shaft for blower. The GSM module requires location with GSM signal. It is designated for customers whose wastewater treatment plant is placed at a distance of more than 5 m from the building (house, parking garage, technical room). The blower shaft enables the mounting of the blower. It may be placed as close to the wastewater treatment plant as possible, thus ensuring the highest pressure of supplied air. The blower is accessible without any problems and is easy to control and service. The locking of the shaft, which serves primarily for the safety of children and as protection against theft is a new feature. In terms of design, it is in perfect harmony with the wastewater treatment plant. The blower shaft is designated for AT wastewater treatment plants. Dimensions: diameter 60 cm x height 40 cm. It serves to reduce the above ground visible area of your home sewage treatment plant from average Stadard cover (diameter ca. 140 cm) to a flat cover (diameter about 60 cm). 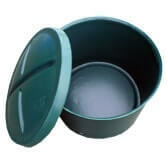 This reduction is produced by rotational molding, which grants its high quality and durability. It is designed for small wastewater treatment plants Aquatec AT6 and AT8. The purified water tank captures purified water from the AT wastewater treatment plant for the purpose of its further utilisation for the watering of trees or, as the case may be, re-pumping it into the flow, if its gravitational drainage is not possible. It comes in various sizes from 0.5 m3 up to 6.2 m3, depending on requirements of the customer for the useful content of the tank. 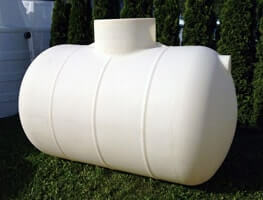 In its basic version, it is an rotomoulded all-plastic tank with a UV stabilised cover and inflow pipeline. The purified water tank is designated for AT wastewater treatment plants. An immersible pump with a floating switch, force pipeline and water division tank may be ordered in addition to all purified water tanks. Telescopic pole - length-adjustable pole, which can be fitted to the cleaning brush or the sludge taking container. Cleaning brush – fits the telescopic pole and is used for cleaning the inside of WWTP, tank of the WWTP, the coat of the WWTP, the walls of WWTP, accumulation equipment and other parts. Sieve with telescopic handle - length-adjustable handle, used to remove unwanted items from the WWTP such as fat clots, and other food waste. Sludge taking container - fits the telescoping pole. The container is used for the removal of activated sludge samples from the WWTP to measure the sludge volume. The containers is also usable for water analysis sampling. Measuring cylinder - used to measure the amount of sludge in the WWTP. The amount of sludge is easily readable on the cylinder scale. Protective gloves - protective gear to handle the service kit.